In this post, we compare the significance of the trades made in the NFL between the opening of the 2012 offseason and the NFL draft. We’ll follow up this post, as usual, with posts on player-based trades during the draft and then in the offseason leading into training camp. As is usual with our Football Relativity posts, the 10 level is for the most significant trades, and the 1 level is for the least significant. 10 – Miami Dolphins trade WR Brandon Marshall to Chicago Bears for 2012 and 2013 third-round picks – Marshall fell off the national radar a bit in Miami, but he is still a true No. 1 receiver who is a catch machine. Plus, in Chicago he is reunited with Jay Cutler, with whom he had so much success in Denver. The cost isn’t bad, especially when you consider that the Bears had an extra third-rounder this year from the Greg Olsen trade. But Marshall’s off-field troubles – which included a police-involved incident just before the trade – obviously wore on the Dolphins. Still, if Marshall can stay out of trouble, he’s a huge addition for the Bears, who have not had a receiver of his talents in eons. His presence will allow Chicago’s other receivers to fall into more appropriate complimentary roles, which should make the Bears offense more potent. It’ll be interesting to see if Marshall can do what it takes to make that happens. 8 – Denver Broncos trade QB Tim Tebow and 2012 seventh-round pick to New York Jets for 2012 fourth- and sixth-round picks – While the Tebow trade was the highest profile deal of the offseason, it won’t be the most significant. That’s because Tebow ultimately doesn’t have the on-field capacity of taking away Mark Sanchez’s job and keeping it. Tebow will steal some snaps and quite possibly some starts away from Sanchez, but if he becomes the No. 1 QB he won’t perform well enough to keep it. The best-case scenario for Tebow is to get a year on the bench in the system to develop and hone his skills and make a run at the starting job in 2013. But New York’s fan base and media isn’t patient enough for that to happen, and so ultimately the Tebow experiment will fail. The Broncos saw this coming in Denver, so they sold low on Tebow, getting minimal value back for a former first-round pick. It’s another in the long line of disastrous consequences of the Josh McDaniels hire. 6 – Philadelphia Eagles trade CB Asante Samuel to Atlanta Falcons for 2012 seventh-round draft pick – We discussed this deal in depth in this piece. 5 – Houston Texans trade LB DeMeco Ryans to Philadelphia Eagles for 2012 fourth-round draft pick and swap of 2012 third-round picks (Texans gain 12 spots) – Ryans was incredibly productive in Houston, but he was lost in the shuffle a bit when the Texans switched to a 3-4 defense last year. He turned into a run-down-only linebacker who wasn’t on the field on passing downs. So the Texans, who were in major cost-cutting mode this offseason, dealt him to Philadelphia. With the Eagles, Ryans can fit more naturally into a 4-3 defense as the middle linebacker, which was a major trouble spot last year. His presence and leadership should help Philly’s other young linebackers perform a little better, which will be a nice side benefit. It’s a shame that Ryans fell out of favor in Houston, because he can play when healthy, but credit to the Texans for recognizing that he was no longer a fit and getting something in return. 4 – Cincinnati Bengals trade OLB Keith Rivers to New York Giants for 2012 fifth-round pick – Rivers, a former top-10 pick, battled injuries throughout his Bengals career, and as a result showed only flashes of brilliance. The Bengals had to move on with Thomas Howard and Manny Lawson, which made Rivers expendable. He’s a bit of a lottery ticket for the Giants, but if he’s healthy he adds a play-making aspect to a linebacking corps that is solid but unspectacular. It’s the kind of gamble that a defending champion can take, because the team is deep enough that a fifth-round pick would struggle to make the roster. 3 – Carolina Panthers trade RB Mike Goodson to Oakland Raiders for OT Bruce Campbell – This is a classic deal in which teams trade players who have fallen out of favor and hope a change of scenery changes things. There’s a better chance of that happening in Goodson’s case, since he has delivered on the NFL level in the past. He showed in 2009 and 2010 that he is a quality runner, receiver, and returner who can back up Darren McFadden in Oakland. But Goodson developed fumbling problems last year and fell into Panthers head coach Ron Rivera’s doghouse. Campbell, a former fourth-round pick, has massive physical ability but has never lived up to his potential. But the Raiders tried him at guard, when he’s more naturally a tackle. The Panthers hope he can develop into a right tackle option who can back up or even replace Jeff Otah. Neither player figured in his old team’s plans, so taking a shot on someone else makes sense. But the Raiders are a little more likely to cash in on this deal. 2 – Philadelphia Eagles trade OT Winston Justice and a 2012 sixth-round pick to Indianapolis Colts for a 2012 sixth-round pick – Justice had fallen out of favor in Philadelphia and lost a starting job, but he’s still a replacement-level right tackle. That’s the role the Colts have in mind as they seek to stabilize a problematic offensive line in advance of Andrew Luck’s arrival. The bargain-basement price – moving down half a round in the sixth – was well worth it, even if Justice doesn’t hold a starting job all season. 1 – New York Jets trade QB Drew Stanton and a 2012 seventh-round pick to Indianapolis Colts for 2012 sixth-round pick – The Jets signed Stanton to be Mark Sanchez’s backup, but after trading for Tebow, they did right by Stanton and found him another place to be a No. 2. The change-of-direction cost the Jets $500,000, but at least they got a little bit of draft value in return. For the Colts, who had no backup quarterback, adding Stanton is a solid move that didn’t even cost them a draft pick. Instead, they dealt the sixth-rounder they got in the Winston Justice trade and moved down to the seventh. Getting Justice, Stanton, and a seventh-rounder for their sixth-round pick is really good value for a Colts team badly in need of depth. Should Jets jettison Mark Sanchez? What does Mark Sanchez need to do to rebuild Jets’ confidence? For National Football Authority, we analyze the issues in the New York Jets’ locker room and what QB Mark Sanchez needs to do to be a leader in it. Can he become a leader, or is his status a lost cause? Click here to find out. For National Football Authority, we break down the New York Jets’ 28-24 win over the Buffalo Bills. Click here to read about Mark Sanchez’s down and up day, Bills WR Stevie Johnson’s success and controversy, Bills RB C.J. Spiller’s start, and more. Each week during the season, we compare all 32 NFL teams using the Football Relativity tool, which puts the best teams at the 10 level and the worst teams at the 1 level. So before the season begins, we want to break down the upcoming season by discussing all 32 teams and their chances. 10 – Green Bay Packers – The Pack is back, and the defending champions get more toys to play with as key players like TE JerMichael Finley and RB Ryan Grant return from injured reserve. That should help the Pack, who barely snuck in the playoffs only to reel off an impressive run to a championship, have an easier berth into the postseason this year. QB Aaron Rodgers is ascending to the elite level, and there’s probably no better signal caller in the league right now. He has a deep group of wideouts led by Greg Jennings, who has become a true No. 1 wideout. And the offensive line, which was battered last year, has added first-rounders Derek Sherrod and Bryan Bulaga in the past two years, which should add to consistency by the end of the season. 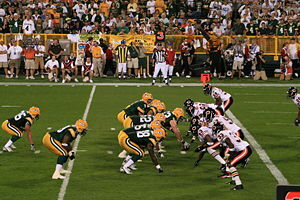 On defense, the Packers have an attacking style that stars Clay Matthews and relies on a beefy, talented line with B.J. Raji and company. And in Tramon Williams, veteran Charles Woodson, and the ascending Sam Shields, the Packers have one of the league’s best CB groups. No team in the NFL is more talented across the board, and it’s been years since a defending champion came back with as good a chance to repeat. 9 – Philadelphia Eagles – The splashy “Dream Team” added a ton of name players, but the team’s fate will rise and fall on the health of Michael Vick. If Vick can stay healthy, the Eagles will put up points with the best of them. RB LeSean McCoy and WR DeSean Jackson lead a class of playmakers that’s beyond compare. However, the offensive line is in major flux with four new starters, and that could become an issue. On defense, the Eagles add a ton of big-name players, led by CB Nnamdi Asomugha, but there’s no guarantee that things will gel quickly. The Eagles have so much talent that by the end of the year they’ll be a power, but the early-season adjustments could cost them home-field advantage and ultimately leadership of the NFC. 9 (con’t) – New England Patriots – The Pats have developed a recent history of excelling in the regular season and then falling apart in the postseason. But that troubling trend doesn’t change the fact that they’re a regular season power. Tom Brady had one of his best seasons in 2010, and while he no longer has Randy Moss, throwing to Wes Welker, Aaron Hernandez, Rob Gronkowski, and others will still work well. The running game was pretty good last year as well, and adding rookies like Stevan Ridley should only help. And the Pats have done a good job of adding young offensive linemen to keep that unit from getting old all at once. On defense, the Pats added a bunch of veteran defensive linemen that will help them be more versatile and should help them create more pressure. Vince Wilfork still is the heart of that unit. And younger players like ILB Jerod Mayo and CB Devin McCourty have added to the defense as well. New England is still trying to get its safety situation situated, but that doesn’t feel like a fatal flaw. Who knows if the Patriots can fix their postseason problems in 2011. But rest assured that they’ll be in the playoffs once again. 9 (con’t) – Pittsburgh Steelers – The Steelers have a ton of strengths and the same weakness that has lingered for years (although they’ve overcome it). The big strength is on defense, where Pittsburgh’s 3-4 remains one of the best attacking defenses in the league. That’s led by OLBs James Harrison and Lamarr Woodley, but it features other standouts like NT Casey Hampton, ILB Lawrence Timmons, and CB Ike Taylor. Pittsburgh does a great job of integrating younger players and knowing when to let veterans go, and that allows the defense to maintain a high level. On offense, the Steelers continue to move toward a major passing offense with QB Ben Roethlisberger and a receiving corps that features vet Hines Ward and young speedsters Mike Wallace, Antonio Brown, and Emmanuel Sanders. The big issue is the offensive line, which has an elite young center in Maurkice Pouncey but a lack of premium talent elsewhere. That hasn’t stopped the Steelers before, but we keep waiting for the shoe to drop. Still, the Steelers are ready to make a run yet again. 8 – Tampa Bay Buccaneers – No team in the NFL depends on youngsters more than the Bucs do, but Tampa Bay is blessed to have a ton of talented and productive youngsters who can lead the team to prominence. Foremost among them is QB Josh Freeman, who has the game and the mindset to be a superstar. His crew – RB LaGarrette Blount and WRs Mike Williams and Arrelious Benn – will grow with him. Those baby Bucs got the offense going last year; this offseason, the team added youth on defense with rookies at defensive end in Adrian Clayborn and DaQuan Bowers and at middle linebacker in Mason Foster who will start or play key roles. CB Aqib Talib gets in trouble off the field, but on the field he’s an elite corner, and DT Gerald McCoy returns to the field after an injury halted his rookie season. The Bucs will only make the playoffs if their youngsters continue to develop, but we see that happening. Freeman and company are headed to the playoffs in 2011. 8 (con’t) – Atlanta Falcons – The Falcons are going for broke in 2011 after an offseason designed to add pieces that put them over the top. Rookie wide receiver Julio Jones is supposed to add breakaway ability that will keep opponents from keying on Roddy White. If that happens, QB Matt Ryan will have his best group of targets ever. The offensive line kept two key free agents in Tyson Clabo and Justin Blalock, which should allow the running game of Michael Turner and company to continue to thrive. The defense added pass rusher Ray Edwards to pair with John Abraham. The Falcons also have terrific players entering their primes in MLB Curtis Lofton and CB Brent Grimes. Atlanta is loaded; the problem is that the NFC South is loaded as well. So winning the division is no sure thing, but a third playoff berth in four years should be. 8 (con’t) – Baltimore Ravens – A month ago, we were ready to write off the Ravens and predict them to miss the playoffs. But the Ravens have added some key veterans in WR Lee Evans, C Andre Gurode, and OT Bryant McKinnie who will help shore up trouble spots on offense. Those additions should allow QB Joe Flacco, RB Ray Rice, and WR Anquan Boldin to do their jobs without too much undue pressure. It’s time for Flacco to step up and lead a prolific offense, not just a decent one. On defense, the Ravens have premium players in DE Haloti Ngata, OLB Terrell Suggs, ILB Ray Lewis, and S Ed Reed, but they need better play from the players around them. The pass rush flagged last year, and cornerback is a question mark unless guys like Cary Williams and rookie Jimmy Smith step up. The Ravens have the talent to make a postseason run if they can get into the playoffs, and that’s exactly what we expect them to do. 8 (con’t) – San Diego Chargers – The Chargers were No. 1 in the league in offense and in defense last season, but the special teams were so horrific that it cost them games and ultimately a playoff berth. Even is San Diego fixes those units only a little bit, they’re going to be in the mix. The Bolts have an electric offense led by QB Philip Rivers, and this time around WR Vincent Jackson and OLT Marcus McNeill will be around from Week One. If Antonio Gates stays healthy, the offense will be at full capacity. RB Ryan Mathews was a disappointment as a rookie, but Mike Tolbert was a nice surprise, and that duo will get the job done. On defense, the Chargers don’t have the superstars they once did, and losing ILB Kevin Burnett hurts, but there’s enough talent around to more than get the job done. The Chargers need to avoid a slow start and a special-teams implosion, but if they do they should cruise in the AFC West and threaten for the conference title. 7 – New Orleans Saints – The Saints defended their Super Bowl title with a wild-card berth and a disappointing playoff loss in Seattle last year. The offense, led by Drew Brees, was prolific, but it turned the ball over far too often. The running game will look different this year with Reggie Bush gone and rookie Mark Ingram in place, but the Saints still have a versatile group of backs and receivers that will give Brees options. On defense, the Saints rebuilt their defensive line, and they have a nice crew of young defensive backs led by free safety Malcolm Jenkins. But the linebacker crew is far from impressive, and the Saints have to prove they can stop opponents and not just create turnovers. New Orleans will be dangerous and could beat anyone in the league, but we are getting a sniff of inconsistency that will have the Saints falling to 9-7 and third place in the NFC South. 7 (con’t) – New York Jets – The Jets are a hard team to figure, because they barely sneak into the playoffs and then make a run once they get there. The high-profile postseason wins can mask some issues with the roster. On defense, the Jets didn’t create as much pressure last year, and additions like first-round pick Muhammad Wilkerson aren’t enough to fix that. The defense has really good players like ILB David Harris and CBs Darrelle Revis and Antonio Cromartie, but it will have to win by shutting down opponents instead of by creating a bunch of turnovers. Will Rex Ryan really want to play that style? On offense, QB Mark Sanchez shows up in big moments but isn’t consistent enough, and losing WRs Braylon Edwards, Jerricho Cotchery, and Brad Smith (replaced by Plaxico Burress and Derrick Mason) doesn’t help. Keeping Santonio Holmes was vital, because he can be a No. 1 wideout for Gang Green. The offensive line lost another veteran in the retired Damien Woody as well. It will be a hard slog for the Jets to get to the postseason, but based on their track record, we expect them to sneak in under the wire. 7 (con’t) – Kansas City Chiefs – The Chiefs are building something good in Kansas City, but last year’s division title doesn’t mean that they’re on the road toward the elite just yet. With offensive coordinator Charlie Weis gone, K.C. needs QB Matt Cassel to continue his ascent. He had a fine season last year, as did WR Dwayne Bowe. The Chiefs add WR Steve Breaston but lost emerging TE Tony Moeaki for the season. The running game will be strong with Jamaal Charles, Thomas Jones, and addition LeRon McClain, and the offensive line gets help from Jared Gaither. On defense, the Chiefs have a top-flight pass rusher in Tamba Hali, and rookie Justin Houston could emerge on the opposite side. And CBs Brandon Carr and Brandon Flowers do a good job, while S Eric Berry had a strong rookie year. The Chiefs are building something, but they’re not as talented as the Chargers and will slip down the standings a bit this year. 6 – Chicago Bears – The Bears improbably claimed the NFC North title last year, although their rivals to the north beat them in the NFC title game. Still, it was a promising performance for a team that has talent as well as holes. QB Jay Cutler drew criticism for going on in the conference championship game with a knee injury, but he took a beating all year and still produced. His receiving corps isn’t great, but he has a top back in Matt Forte. The problem is the offensive line, which was awful in the first half of the season but a little better in the second half. On defense, the Bears got a great performance from Julius Peppers in his first year with the team, and his presence unleashed Israel Idonije on the other side. LBs Brian Urlacher and Lance Briggs are veterans who still produce, as is CB Charles Tillman. The Bears’ window is closing on defense, because so many key players have been around a while, but it should be enough to keep the Bears in playoff contention in 2011. 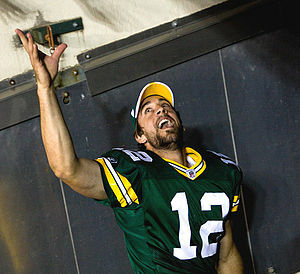 They won’t beat the Packers this year, but a 9-7 wild card is still on the table. 6 (con’t) – St. Louis Rams – Under head coach Steve Spagnuolo, the Rams have done a good job of rebuilding from the lowest of lows earlier this decade. The centerpiece of that rebuilding process is QB Sam Bradford, who had a solid rookie season and showed the potential to be great. Bradford now gets to work with offensive coordinator Josh McDaniels, who should be able to maximize Bradford’s talents. The Rams have depth but not stars at wide receiver, but youngsters like WRs Danny Amendola and Brandon Gibson, and rookie TE Lance Kendricks are emerging. As they do, proven RB Steven Jackson continues to pile up yards behind an offensive line that has gotten a lot better with additions like 2010 rookie OLT Rodger Saffold and 2011 signee OG Harvey Dahl. On defense, the Rams finally got a breakout season from DE Chris Long, and MLB James Laurinaitis has proven to be a productive force. The secondary lags a little behind, but if the Rams can create enough pressure it should be enough. The Rams aren’t great, but they’re better and deeper than any other team in the NFC West and should claim the division this year after falling just short in 2010. 6 (con’t) – Washington Redskins – The Redskins have done some good things this offseason, but all the momentum has been covered up by the quarterback conundrum between Rex Grossman and John Beck. Grossman is getting the call to start the season. He’ll have a running game based around Tim Hightower, who fits the offensive system head coach Mike Shanahan wants to play. The offensive line is not the typical Shanahan unit, however. On defense, the Redskins have added several key pieces and should be even better than last year’s surprisingly solid group. Even with the quarterback play, the Redskins are a sleeper playoff team. 6 (con’t) – Dallas Cowboys – Last year was a disaster for the Cowboys, who stumbled to such a terrible start that Wade Phillips got the boot. The team rebounded a bit under Jason Garrett, and now Garrett must prove that he can get the job done from day one. He’ll have Tony Romo this time around, as the quarterback returns from injury. With Romo, TE Jason Witten, and WRs Dez Bryant and Miles Austin, the Cowboys are strong at the skill positions, but changes on of the offensive line could be a problem. On defense, the Cowboys bring in coordinator Rob Ryan and his aggressive ways. That should allow OLBs DeMarcus Ware and Anthony Spencer to excel; the question is whether the secondary is strong enough to keep opponents at bay. The Cowboys won’t be a disaster, but there are enough questions that they’ll big in a dogfight to get past 8-8. 6 (con’t) – Miami Dolphins – The Dolphins are flying (swimming?) under the radar as the season begins, but they are an interesting team. On offense, Reggie Bush adds a dynamic element to the offense, and Brandon Marshall seems to be getting off-field help that could help him produce on the field. None of that will matter, though, unless QB Chad Henne improves on his 2010 performance. Henne’s preseason performance was encouraging, but he’s at the prove-it point of his career. The offensive line has a standout in OLT Jake Long, but things over the rest of the line have been turned over. Relying on Henne and Bush is risky, but both have talent. On defense, the Dolphins are getting better and better. OLB Cameron Wake and NT Paul Soliai emerged as keystones last year, and free-agent signee ILB Kevin Burnett adds a new element beside Karlos Dansby. And as young CBs Vontae Davis and Sean Smith mature, the defense will be scary. The division is tough, but the Dolphins have a shot – if the Bush and Henne gambles pay off. 6 (con’t) – Jacksonville Jaguars – We covered the Jaguars in this season preview – and then the Jaguars cut QB David Garrard. Still, in an AFC South division that could be won at 9-7, we believe the Jaguars can edge out the Texans and Colts to win the division. 6 (con’t) – Houston Texans – The Texans have to believe their time is now. The Colts are in injury limbo, and the Texans made aggressive moves to upgrade the defense by adding CB Johnathan Joseph, S Danieal Manning, DE J.J. Watt, and OLB Brooks Reed. New coordinator Wade Phillips has had good results in the past, but his system doesn’t match his best player, Mario Williams. If Phillips can put Williams to best use, the defense will work, but we’ll have to see it to believe it. On offense, the Texans will still be prolific thanks to QB Matt Schaub, WR Andre Johnson, and RB Arian Foster. But if the season comes down to shootout after shootout, we see the Texans falling short too often. The conventional wisdom has the Texans making the playoffs finally, but we don’t see it. 5 – Detroit Lions – The Lions are on the way up. Now the question is whether the next move forward is a step or a leap. We lean toward the step side, picturing the Lions as an 8-8 team but not a playoff squad. There’s plenty to like in Detroit: DT Ndamukong Suh wreaking havoc, QB Matthew Stafford throwing deep to WR Calvin Johnson, and the electric play of RB Jahvid Best. But the injury issues that Stafford and Best have had in the past – and that rookie DT Nick Fairley has now – have to bride enthusiasm a bit. So does the state of the secondary, which still needs upgrades at cornerback. The Lions have gone from awful to competitive under head coach Jim Schwartz, but it’s not time yet for them to break through. 5 (con’t) – New York Giants – No team has been hit harder by injuries this preseason than the Giants, who lost starters CB Terrell Thomas and LB Jonathan Goff, along with four key defensive backups, all for the season. That leaves a defense that has big-time pass rushers in Justin Tuck and Jason Pierre-Paul with big deficits behind the strong front line. On offense, QB Eli Manning must overcome his turnover problems from 2010. He did make a ton of big plays, many to emerging star Hakeem Nicks, but losing Steve Smith and Kevin Boss in free agency hurts. And the offensive line, such a constant during most of the Tom Coughlin era, is getting a complete overhaul. This feels like a step back year for the Giants. They could easily fall into fourth in the always tough NFC East. 5 (con’t) – Indianapolis Colts – This is the year that the Colts’ playoff streak finally ends – and not just because of QB Peyton Manning’s injury problems. Manning had covered over a variety of faults for the Colts – a sorry offensive line, average running backs, and injury-plagued wide receivers. So while Reggie Wayne, Dallas Clark, Pierre Garcon, and Austin Collie have talent, it’s hard to see the Colts taking full advantage, at least until Manning gets back to 100 percent. And on defense, while pass-rushing DEs Dwight Freeney and Robert Mathis can create havoc, they aren’t shut down players. It’s hard to see the Colts’ D holding up when the offense isn’t staking it to a lead. A fall is coming – the question is whether it will be a slip out of the playoffs or a massive collapse for the Colts. The horseshoe ain’t going to be lucky this year. 5 (con’t) – Oakland Raiders – The Raiders went through a lot of change this offseason, installing Hue Jackson as head coach and and losing high-profile CB Nnamdi Asomugha. But Oakland is still talented. The defense has impact players in OLB Kamerion Wimbley, DT Richard Seymour, and CB Stanford Routt, and that will keep them in games. And the running game led by Darren McFadden and Michael Bush was shockingly strong last year. QB Jason Campbell lost one of his best targets in TE Zach Miller, and while Kevin Boss is a solid starter, he’s a downgrade. So is the loss of OG Robert Gallery on an offensive line that is big and strong but inexperienced. Oakland will need young receivers like Jacoby Ford to continue to emerge for Campbell, and it’s fair to expect some inconsistency there. The Raiders won’t fall apart, but they lost a bit too much to match last year’s 8-win total or AFC West sweep. 4 – Arizona Cardinals – The Cardinals were doomed in 2010 by horrific QB play, so paying a high price to add Kevin Kolb should make a big difference. Kolb is good enough to get the ball to Larry Fitzgerald, who remains one of the best wideouts in the league. Arizona will need someone, maybe TE addition Todd Heap or breakout WR candidate Andre Roberts, to emerge as enough of a threat to take some coverage away from Fitzgerald. The running game is a question mark because of trades and injuries, so Beanie Wells and Chester Taylor need to step up. That won’t be easy behind a mediocre offensive line. On defense, the Cards need FS Adrian Wilson to return to prominence as rookie CB Patrick Peterson and second-year ILB Daryl Washington emerge as forces. The Cards will be better, thanks mostly to the upgrade Kolb provides, but that won’t be enough for a playoff run. 4 (con’t) – Cleveland Browns – The Browns are in the midst of a rebuilding project, but the progress thus far has been pretty good. QB Colt McCoy may never be a Pro Bowler, but he should emerge as a solid starter in the West Coast style of offense GM Mike Holmgren and head coach Pat Shurmur will use. His group of receivers is young, but rookie WR Greg Little and TE Evan Moore could be major factors. The Browns are in good shape up front thanks to OT Joe Thomas and C Alex Mack, and RB Peyton Hillis provides a physical running game. On defense, the Browns are quite young, but they had a great find in CB Joe Haden last year, and they hope fellow youngsters like DE Jabaal Sherad and SS T.J. Ward also develop into stars. The Browns probably need one more draft and free agency cycle to truly move into contender-dom, but they should make a run toward respectability this season. 3 – Minnesota Vikings – The Vikings are just over a year away from playing into overtime in the NFC championship game, but the decline has been steep. Now the Vikes have a beaten up offensive line, an aging defensive line, and a placeholder at quarterback. Donovan McNabb is a star when it comes to Q-rating, but his play on the field is no longer at that level. He’s just taking snaps until rookie Christian Ponder is ready. Neither quarterback will have great targets aside from Percy Harvin. At least Adrian Peterson remains one of the league’s elite running backs. But Peterson will struggle to keep this crew in games, not to mention ahead. On defense, DE Jared Allen’s play fell off last year, and DT Kevin Williams will miss the first two games of the year. Now the Vikings need to recenter their defense around LBs Chad Greenway and E.J. Henderson. Leslie Frazier is a good coach, but there’s a reason this team fell apart on Brad Childress last year. The window has closed. 3 (con’t) – Buffalo Bills – We covered the Bills in depth in this post. 3 (con’t) – Denver Broncos – The Broncos, under new head coach John Fox, should be more competitive than last year. QB Kyle Orton has proven to be effective if not always dynamic. He developed a terrific rapport with Brandon Lloyd last year, but can Lloyd repeat his breakout season without Josh McDaniels? He needs to, because the rest of the receiving corps is thin. At running back, Fox can use both Knowshon Moreno and Willis McGahee. The offensive line has a premium left tackle in Ryan Clady but not much else. On defense, Elvis Dumervil returns, and rookie Von Miller comes to time, but neither player is a hand-in-glove fit for Fox’s 4-3. Defensive tackle is a trouble spot. In the secondary, vets S Brian Dawkins and CB Champ Bailey need to continue a solid level of play. The Broncos need a rebuild after the disastrous McDaniels draft results, and this year will show just how far they have to go. 2 – Carolina Panthers – We previewed the Panthers in depth in this post. 2 (con’t) – Seattle Seahawks – We previewed the Seahawks in depth in this post. 2 (con’t) – Cincinnati Bengals – It’s good news, bad news for the Bengals. They have some good young receivers in A.J. Green, Jordan Shipley, Jermaine Gresham, and Jerome Simpson. But the offensive line is no great shakes, especially with Bobbie Williams suspended for the first four games of the season, and it could cause trouble. Rookie QB Andy Dalton was good in college, but we don’t know if he has the skills to succeed at the NFL level – especially once defenses throw the kitchen sink at him. On defense, the Bengals lost CB Johnathan Joseph, but they still have Leon Hall, who’s an elite player at that position. But the pass rush doesn’t generate enough pressure, and the linebacker play has been up and down. If the defense can come together, the Bengals could approach 8-8, but we see 4-12 as a more likely outcome. 1 – San Francisco 49ers – The 49ers, under new head coach Jim Harbaugh, have a few stars but lack talent in too many key areas. It starts at quarterback, where Alex Smith gets another chance despite a lack of results. Smith has a very good running back in Frank Gore and talented targets in WRs Braylon Edwards and Michael Crabtree and TE Vernon Davis, but the whole is less than the sum of the parts. And the offensive line, despite some high draft picks, struggled throughout the preseason. On defense, ILB Patrick Willis remains a superstar, but the talent around him is worse than last year, unless rookie OLB Aldon Smith is more ready to play than most expect. Harbaugh has a steep challenge in front of him, because the 49ers are among the league’s worst teams. They may steal some wins in the weak NFC West, but this franchise is at the bottom. 1 (con’t) – Tennessee Titans – The Titans are in major flux, and we don’t see many signs of hope, but at least they kept RB Chris Johnson in town. He’s joined by veteran QB Matt Hasselbeck, who will play until rookie Jake Locker is ready. The offensive line is still OK, and that should allow the running game to keep producing. And in WR Kenny Britt and TE Jared Cook, the Titans have talented receivers. But on defense, the Titans have lost a ton of key players, and aside from CB Cortland Finnegan and S Michael Griffin won’t be starting anyone you’d recognize. It’s hard to see the Titans shutting down many teams, even in the declining AFC South. *Ben Roethlisberger did not have a pretty game, but he did a few things that make him such a dangerous quarterback in the postseason. First, he ran the ball well – running for 21 yards and a touchdown, and notching a couple of key first downs in the process. Secondly, even though he was not sharp throwing the ball on the whole, he completed key passes to Heath Miller and Antonio Brown that allowed the Steelers to run the clock out when they got the ball back with three minutes remaining. So even though he was 10-for-19 for 133 yards with two interceptions (one of which came on a deflection) and a couple of other dicey throws, Roethlisberger gets a gold star for this game. 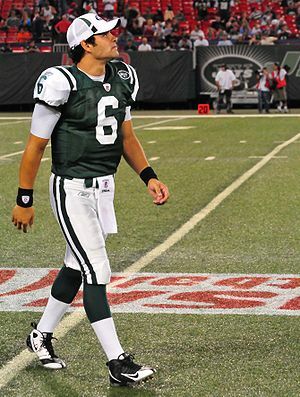 *Mark Sanchez didn’t win, but he showed an immense amount of toughness for the Jets. He was absolutely battered in the first half, culminating with a sack that led to a Pittsburgh defensive touchdown that extended the Steelers’ lead to 24-0. But Sanchez rallied and played well in the second half, throwing touchdown passes to Santonio Holmes and Jerricho Cotchery and nearly leading the Jets back from a huge deficit. Sanchez is a winner, and as he develops as a passer his gifts as a leader will continue to really emerge. *The Steelers completely controlled the game in the first half, starting with a nine-minute drive on their opening possession. And the defense held the Jets to a single net yard over the first 29 minutes of the game. While Pittsburgh didn’t keep that pace up throughout the game, the first half was where they won the game. *We’ve never been huge Rashard Mendenhall fans, but he had perhaps his finest game Sunday. He ran for 127 yards, and he did it with a style that was both physical and shifty. We’ve never though Mendenhall had the ability to make things happen on his own, but he did just that against the Jets, especially early on. He would give ground and then successfully retake it, and that is something that we haven’t seen from him. Good for him for stepping up at a key time. *The Steelers have hit on a lot of first-round picks in recent years on defense, even if it took those players time to develop. Ziggy Hood, who’s done a fine job filling in for Aaron Smith at defensive end, had two early stuffs to help to set the tone for the defense, and Lawrence Timmons led the team with 10 tackles from his inside linebacker spot. Adding those guys to dynamic players like S Troy Polamalu, NT Casey Hampton, and OLBs James Harrison and Lamarr Woodley makes the defense even scaries. That defense dominated the first half and stepped up in the second half with a goal-line stop in the middle of the fourth quarter. *The other Jet who we have high praise for is WR Santonio Holmes, who had a 35-yard touchdown catch to continue his trend of strong postseason play. Holmes also ran a beautiful route to create a pick play that Cotchery exploited for the Jets’ final touchdown. Holmes doesn’t have huge numbers, but he plays as a No. 1 receiver every year in the playoffs. The Jets must re-sign him. *The Maurkice Pouncey injury is a big one for the Steelers. They really need their rookie Pro Bowl center to recover from his high ankle sprain and return against the Packers, who have incredible athletes up front in their 3-4. What will the Greg Schiano era bring to Tampa Bay? Is Drew Brees planning an exit strategy from New Orleans? Are Rams prepared if Sam Bradford gets hurt?